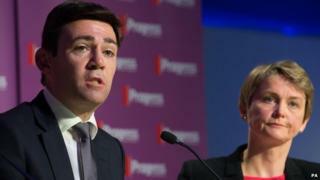 Andy Burnham has the most support so far among Labour MPs to become the party's next leader, with 53 colleagues backing the shadow health secretary. According to figures released by Labour, Yvette Cooper and Liz Kendall have also exceeded the threshold of 35 nominations needed to get on to the ballot paper with 41 and 36 each. Jeremy Corbyn and Mary Creagh have 11 and five nominations at the moment. But more than a third of Labour's 232 MPs have yet to state a preference. Contenders need the support of 15% of MPs to secure a place on the ballot paper for September's election. The winner will be decided by a vote of Labour party representatives, members and affiliates, to be conducted on a one-member, one-vote basis. Details of the progress that the quintet are making towards the nominations target have been published on the party's website and will be updated until nominations close on 15 June. The BBC's Laura Kuenssberg said that 86 out of Labour's 232 Labour MPs have yet to support any of the candidates. The details were released after the five leadership contenders faced questions from 500 GMB union members on the welfare cap, living standards and their views on the party's last election manifesto. Appearing at a hustings in the Irish capital, the five were asked whether they supported the government's plan to lower the annual welfare cap - the total amount that a household can receive in benefits - from £26,000 to £23,000. Ms Kendall and Ms Creagh said they would while Mr Burnham said the issue was "complicated" and it was "unfair" to expect a direct answer at this stage. Ms Cooper also did not give a yes or no response but said the framework underpinning the cap had to change. Mr Corbyn was the only one of the five to categorically oppose the move, saying it could lead to "social cleansing" in London. None of the five explicitly criticised the platform that Labour stood on at the last election, Andy Burnham suggesting its manifesto was "the best" that it had put forward since 1997 because of its focus on reducing inequality. Ms Creagh was the only one of the five to say she would be prepared to share a platform with David Cameron to argue for a Yes vote in a future EU referendum. The GMB union, which has more than 630,000 members, is one of Labour's major financial backers. Its general secretary Paul Kenny attacked former Labour ministers such as Lord Mandelson and Lord Hutton who have suggested the party lost the election because its manifesto was too left-wing. "I have been absolutely sickened by the sight of old has-beens in the Labour Party lecturing us about the manifesto being too left-wing," he told the conference, claiming critics should go back to the museums "they have crawled out of". "They even suggest that the election was lost because the British people wanted a return to New Labour, and throw in attacks on trade unions for good measure. There we have the essence of why millions of trade unionists didn't vote Labour." The hustings is one of a number over the next two weeks, including a debate on BBC Two's Newsnight on 17 June. The result will be announced at a special conference on 12 September. Eight candidates for the position of deputy leader will also be taking part in a hustings in London later.